When you visit JJIE VW Grid, you will arrive at the JJIE Welcome Workshop Arrival Area on a rocky ocean cliff surrounded by ocean waves and open skies. In the Arrival Area, you will find information about The Center for Sustainable Journalism at Kennesaw State University, the CSJ Juvenile Justice Information Exchange program and the JJIE VW Grid project. There is a basic avatar skills flip book for virtual world newcomers, a JJIE virtual world map of all four regions and a local region Welcome Workshop Levels Map Teleport Board. This is also our main Tour Start Point. A giver box provides Tour Landmarks for the immersive orientation path experiences under continuous development through December 2015. Our inworld project development is “responsive” – based on current best practice research and user feedback – so our Welcome Region changes as we collect more data. The Arrival Area is also our main Tour Start Point. 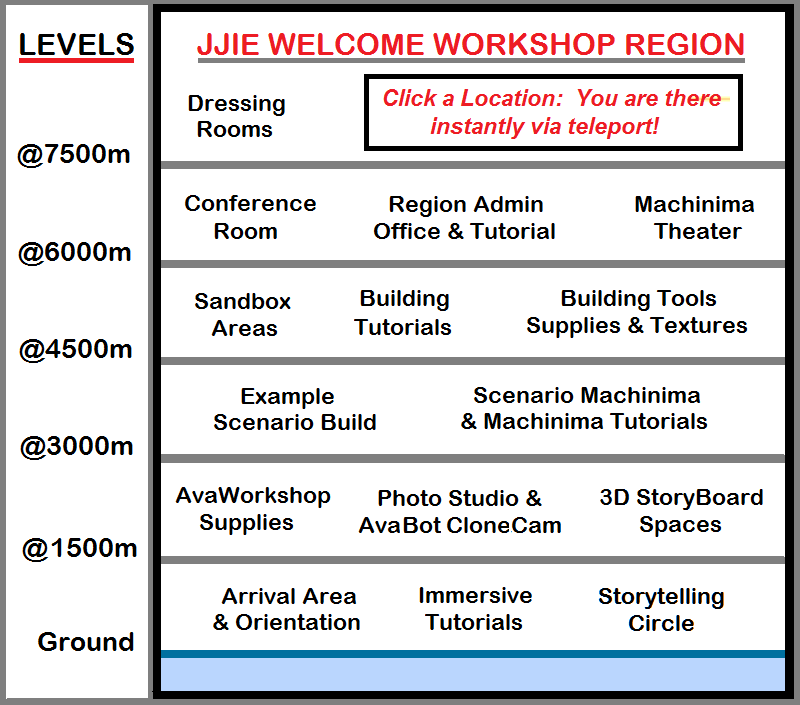 JJIE’s Welcome Workshop is built on gentle, rolling hills with several region-size sky platforms. In the Arrival Area you will see a graphic illustration of each level in the region with live teleport links. You can automatically teleport to any destination in the region by clicking on the location’s title. To see a virtual world artist’s 3D work in action, visit the 1500meter level’s northeast corner, where still image lighting production is underway (November 2015) for the “Forgive” poem machinima. In the JJIE Workshop Two region we have a fully developed Chicago neighborhood circa 1990’s, built by our intern uber Producers, Derek Maier and David Eric Nelson during the summer semester. This set was developed for our first machinima production about young boy detained by police, The Kid, The Cop, The Punch. Currently, this region is being re-utilized as backgrounds for flashback still shots in our upcoming machinima about Christopher Thomas, a 30-year-old man incarcerated at the age of 14. We invite you to visit and explore the neighborhood. There are several NonPlaying Characters (NPC) wandering about Chicago 24/7. Please do not take offense if they are not very talkative. JJIE Workshops One and Three regions are used for experimental/project builds and OAR digital asset mining. 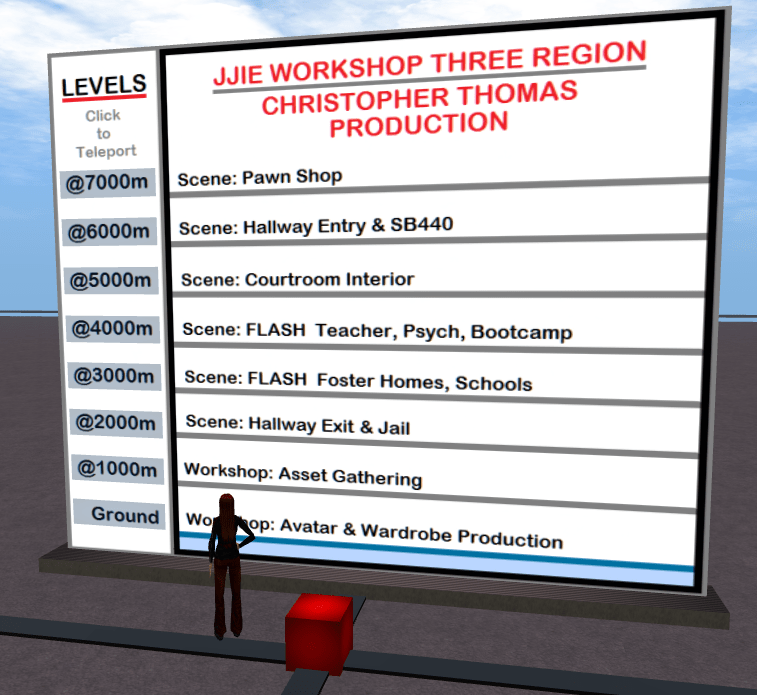 Currently, JJIE Workshop Three is being used for the production of the Christopher Thomas machinima. We are using several region-sized platforms for different aspects of the machinima production pipeline, with the Levels Map Teleport Board seen below on each platform for quick transport between production task areas.